This past May marked 10 years since I moved to New York City. I guess that officially makes me a New Yorker, according to Carrie Bradshaw. Even though I've been here for a decade, I still get giddy when I see the skyline anytime I'm coming back from a trip to visit my family in Ohio or my in-laws in New Jersey. I can't believe I actually get to live here! 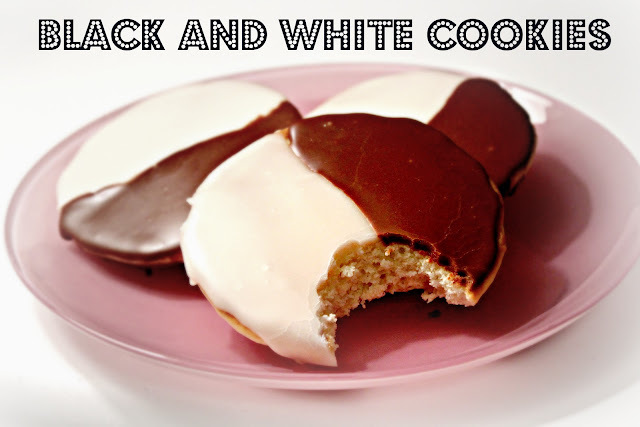 So to celebrate my being a New Yorker, I decided to bake New York's most famous cookie: The Black and White Cookie. I searched around for what I thought would be the best recipe. I've had and love Zabar's version and decided that would be a good place to start. 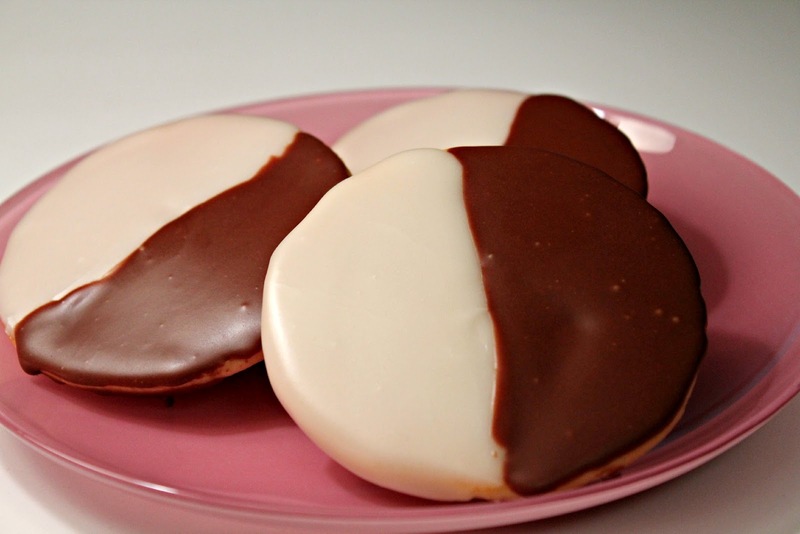 According to The New York Times, which published Zabar's cookie recipe years ago, Black and White Cookies aren't really cookies, but little drop cakes with a bit more flour added so the cookies keep their shape. Making the cookie dough was the easiest part of this baking experiment. The first snafu occurred when, following the recipe's directions, I let the cookies bake for the full 20 minutes. They didn't burn, but they were a tad darker on the bottoms than I would have liked. It made the cookie a firmer than they were supposed to be. For the next batch, I watched the cookies and pulled them out of the oven after 12 minutes. These were much better. 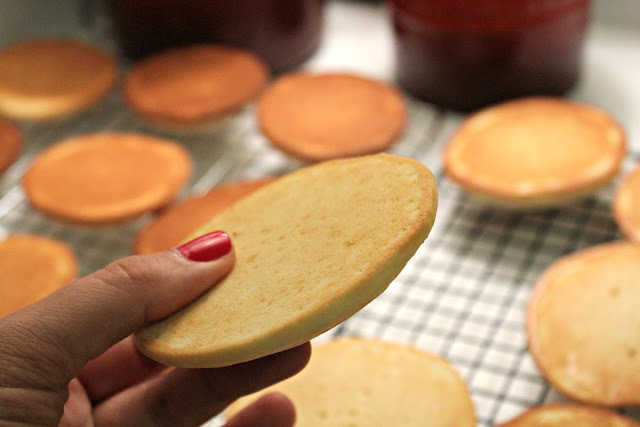 The tops of the cookies should feel slightly firm when touched. 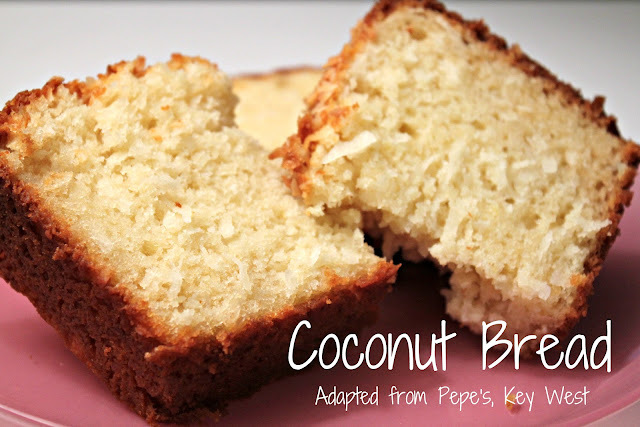 You just don't want the bottoms and the edges to get too brown. The cookies on the right turned out much better than the ones on the left, which I think were a little too hard. 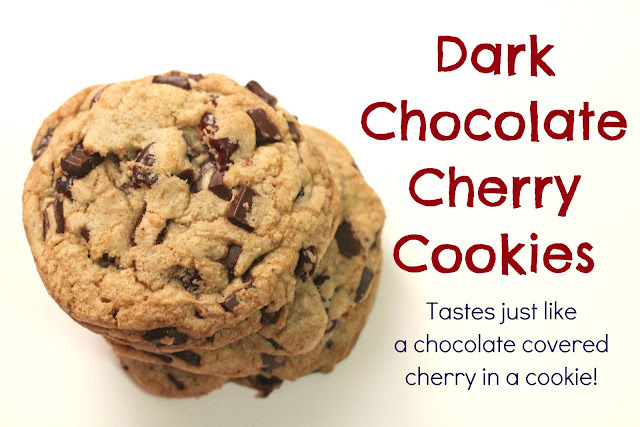 Once the cookies were iced, however, you couldn't tell the difference by looking at them, but the darker ones were drier. These cookies really aren't hard to bake, but they do take some patience when it comes to making and putting on the icing. 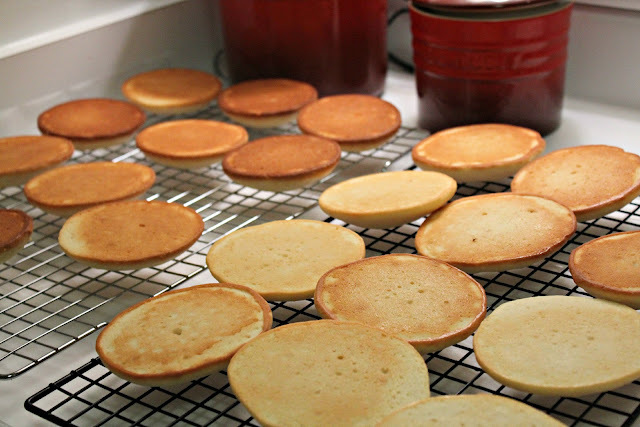 Have extra milk and powdered sugar on hand when mixing the icing. I also suggest using good chocolate for the chocolate icing. Make sure the cookies are completely cool before attempting to ice. I let mine sit out for an hour or so before making the icing. 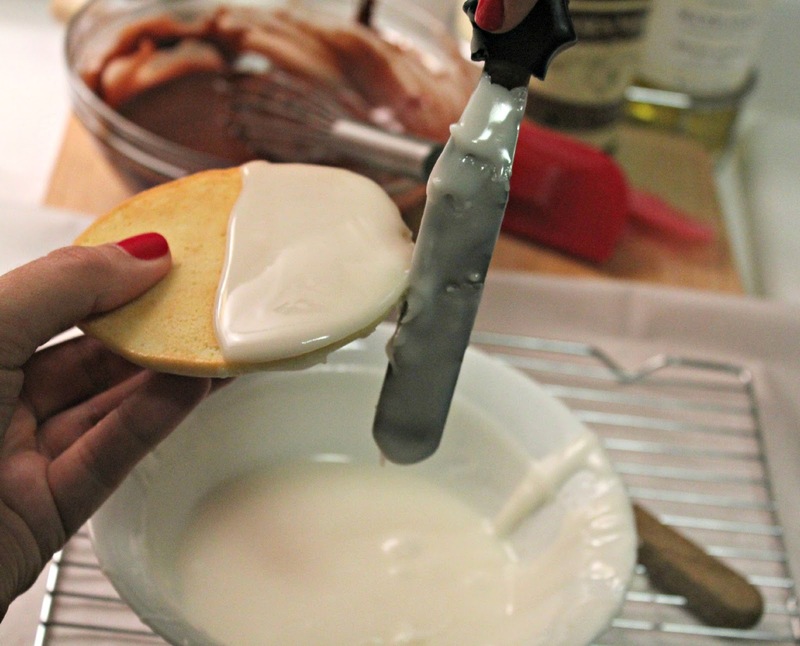 Using an off-set spatula (a butter knife would work, too), spread the white icing over half of the cookie. Make sure to get all the way to the edge and don't skimp on the icing. 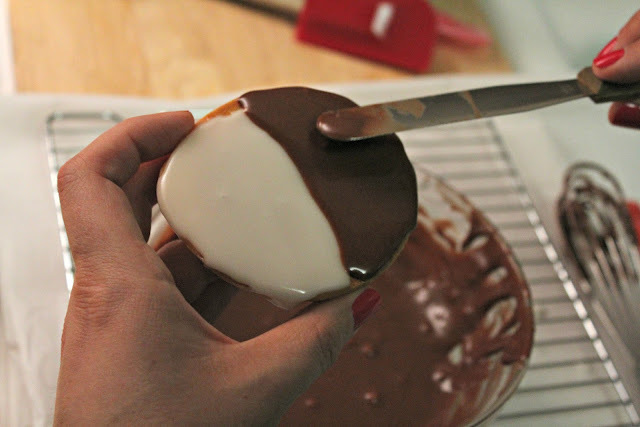 The icing is a bit thin, so you might want to hold the cookie over the icing bowl while spreading. I started with the white side because I figured it would be easier to cover up a non straight line with the chocolate side if I made a mistake. Use the spatula to scrape the side of the cookie to get ride of icing drips. If you notice in the above photo, I put sheets of parchment paper underneath my cookie racks to make clean up a bit easier in case I had runny icing. 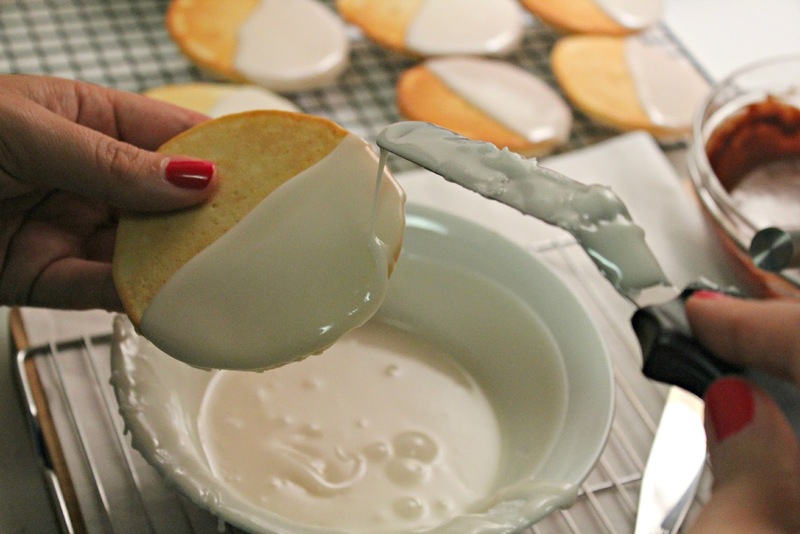 Let the white icing set on the cookies for a good 15 minutes before adding the chocolate side. 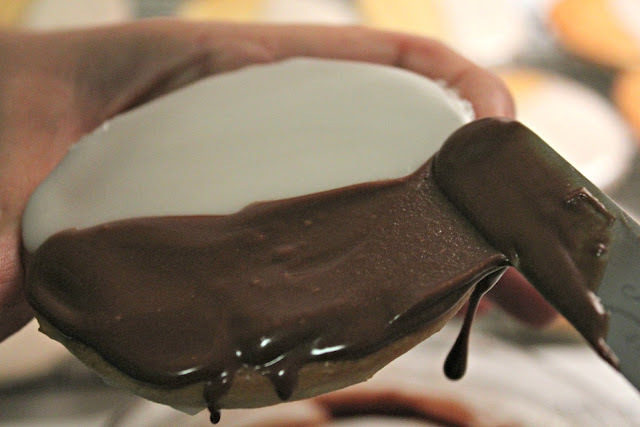 The chocolate icing is made by adding the melted chocolate a cup of the reserved white icing. 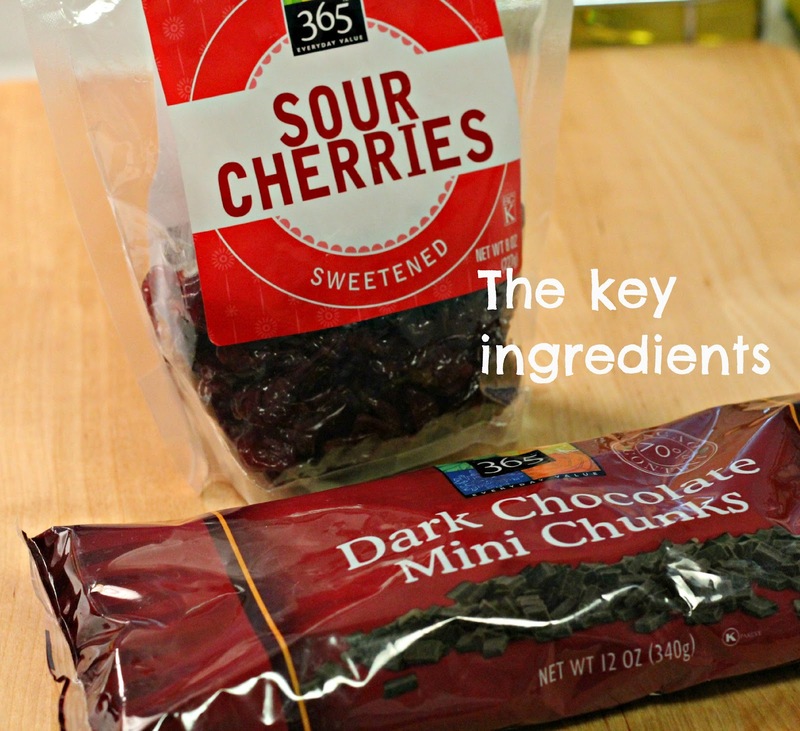 Follow the same technique when adding the chocolate. 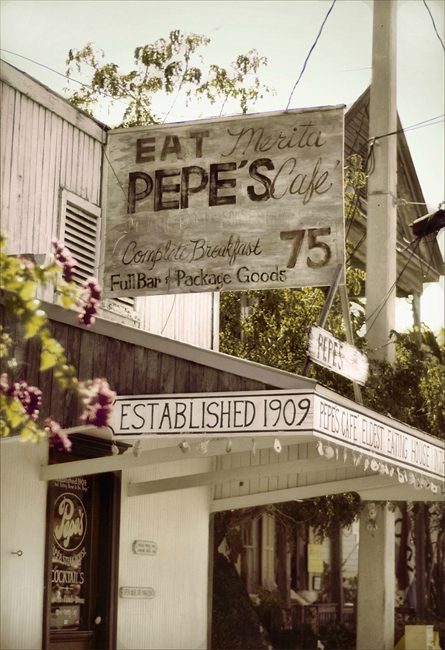 Your hands will get messy. Keep a paper towel handy. Be generous with the chocolate and don't forget to scrape the side of the cookie to catch the drips. When all of the cookies are iced, let them sit for at least an hour to set. 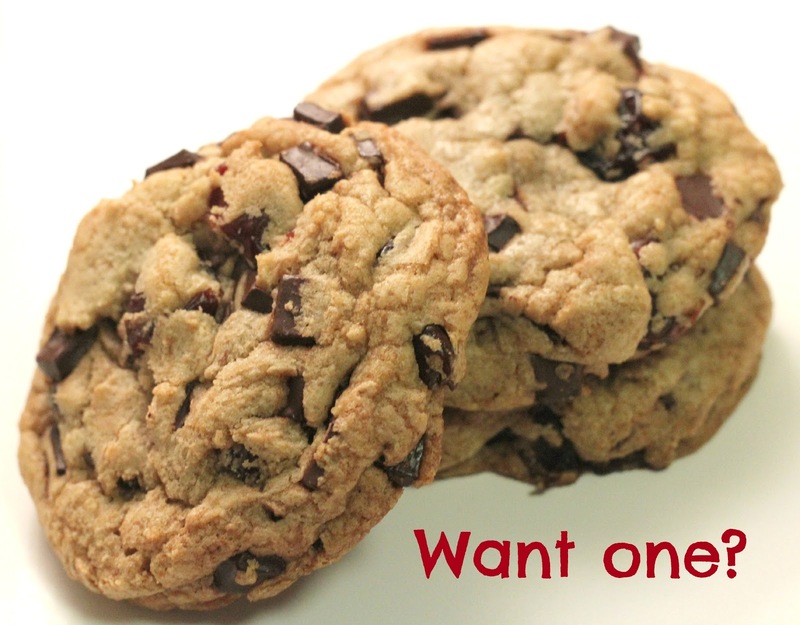 Try to keep your taste tester from eating one. It will be hard. After an hour or so, store the cookies in an air-tight container. The cookies will still be good for about 3 days, if they last that long. 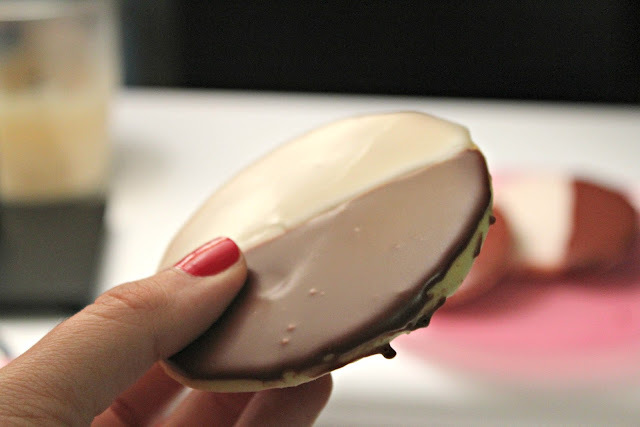 I took these cookies to my parents' house while visiting last weekend and they were thrilled to have a little bite of the City. 1. Preheat oven to 375 degrees. 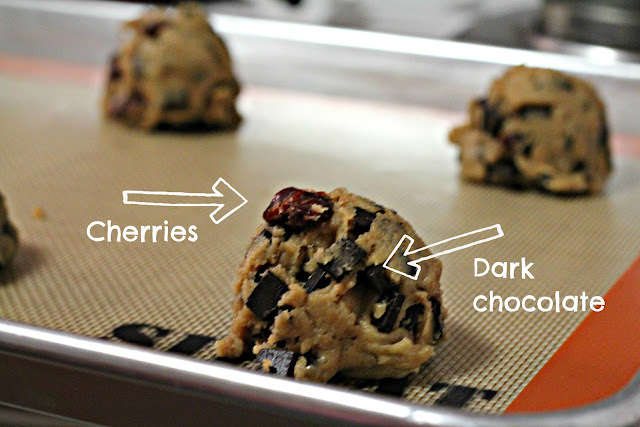 Line cookie sheets with Silpats or with parchment paper. 2. In large mixing bowl, combine sugar and butter. Mix until fluffy. 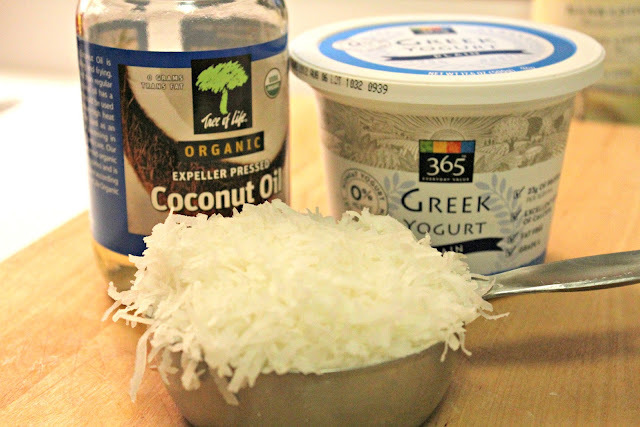 Add eggs, milk and vanilla and lemon extracts, and mix until smooth. 3. 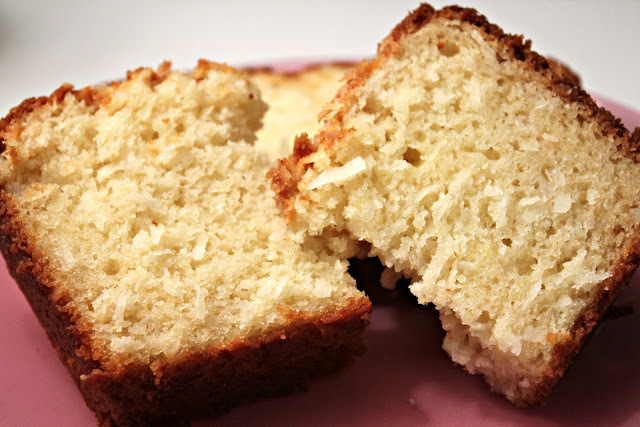 In medium bowl, combine cake flour, all-purpose flour, baking powder and salt. Stir until mixed. Add dry mixture to the wet in batches, stirring well after each addition. 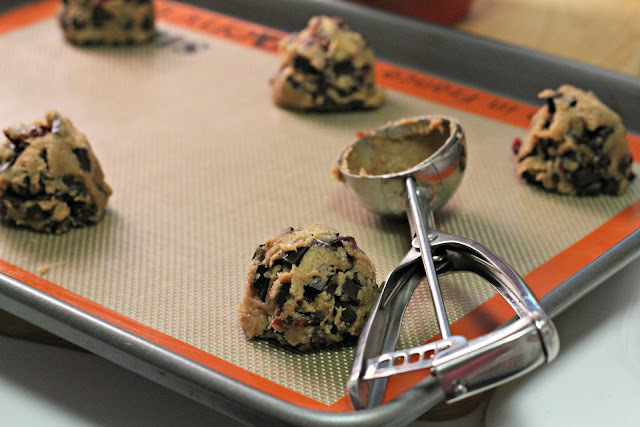 Using a small cookie scoop (or about two tablespoons), place heaping spoonfuls of the dough 2 inches apart on the baking sheets. Bake until edges begin to lightly brown, 12-15 minutes. Watch your oven, as mine were perfect at 12 minutes. Some recipes say to bake for 20 minutes. Cool completely. 4. 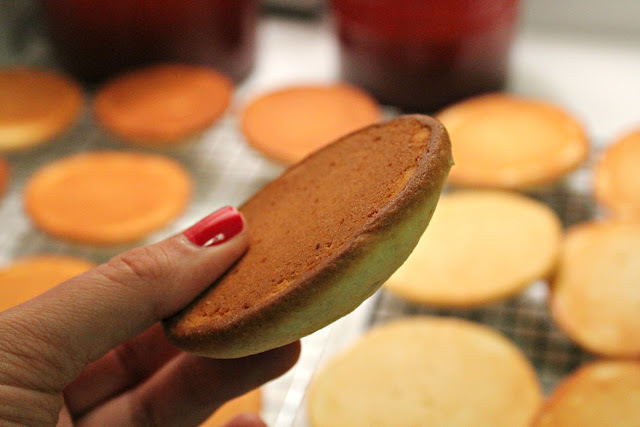 Turn your cookies bottom side up (flat side) on a cooling rack. Place a sheet of parchment or waxed paper underneath the rack to make clean up easier. 5. Place confectioners' sugar in large mixing bowl. Gradually stir in enough boiling water to the sugar to make a thick, spreadable mixture. 6. Reserve about a cup of the white icing. 7. 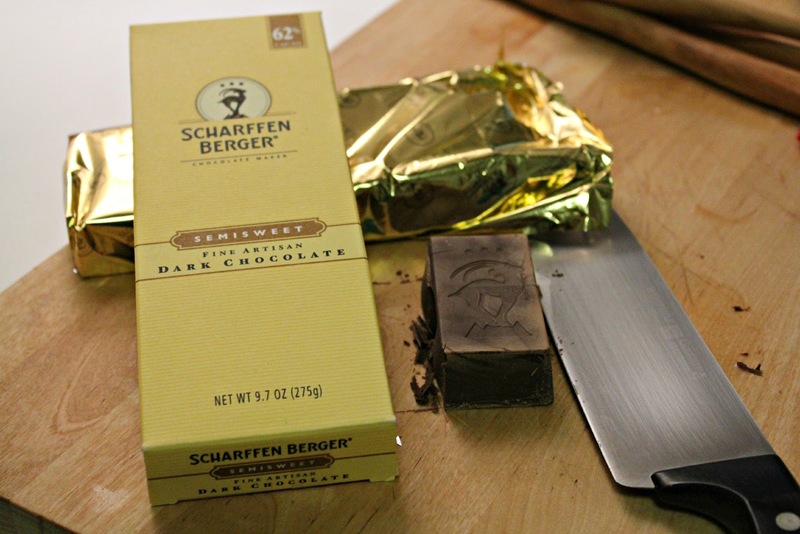 Melt the chocolate over a double boiler (or use a glass bowl on top of a sauce pan). Mix in the corn syrup and then add to the reserved white icing. Periodically stir the icing to keep it smooth while icing the cookies. 9. 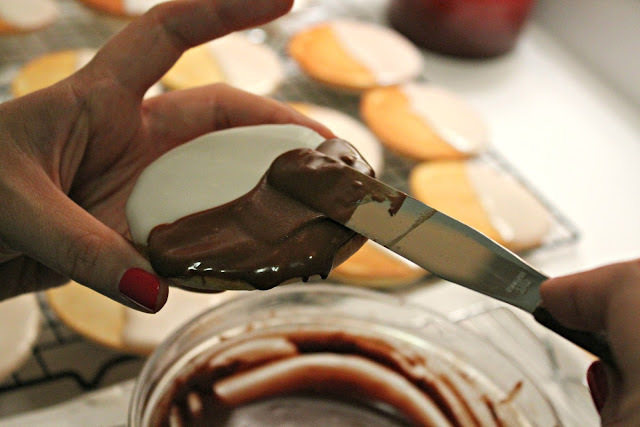 Use a second off-set spatula to apply the chocolate icing. 10. 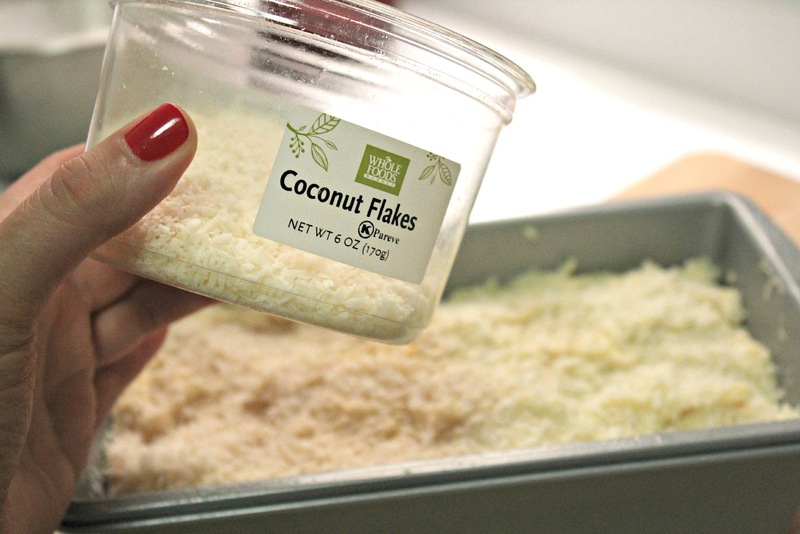 Let dry, about an hour and store in an airtight container. The cookies should keep for about 3 days. P.S. - Thanks to my taste tester for helping take some of these photos. 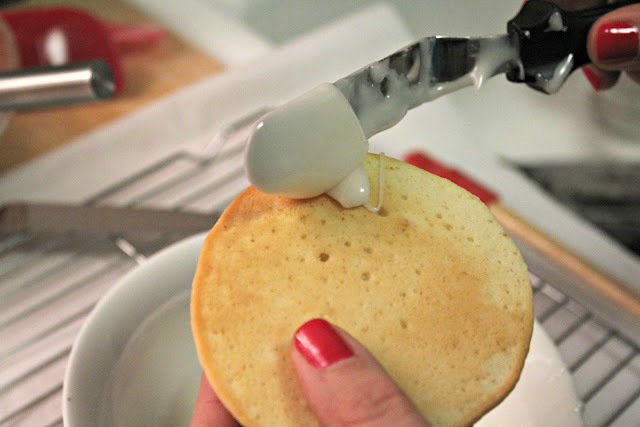 It's really hard to grab a camera while holding a cookie and a spatula topped with icing at the same time!